ASIA NEWS IT Release: Msgr. Paul Bùi Văn Đọc was struck by a stroke yesterday during a concelebration in the Basilica of Saint Paul outside the walls. He had met Pope Francis the day before. Originally from Da Lat, he was consecrated bishop of My Tho by John Paul II. Pope Francis had appointed him coadjutor archbishop of Ho Chi Minh in 2013. 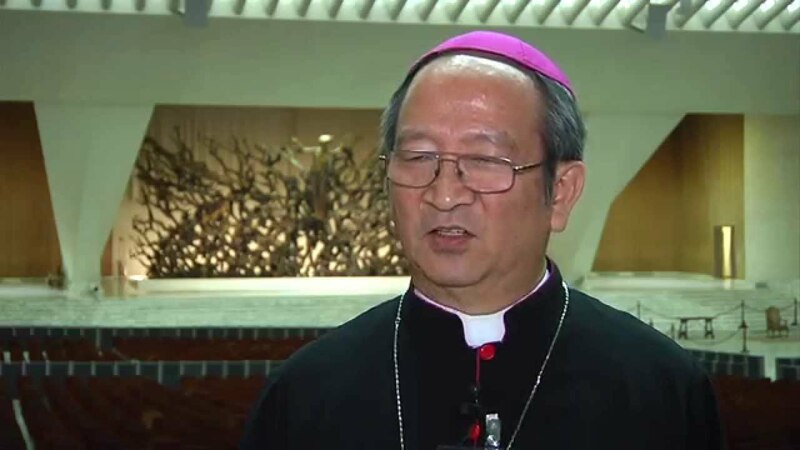 Vatican City (AsiaNews) - The archbishop of Ho Chi Minh City, Msgr. Paul Bùi Văn Đọc died yesterday in Rome during the ad limina visit, just a day after his meeting with Pope Francis along with other Vietnamese prelates. Msgr Paul Bùi Văn Đọc suffered a sudden stroke yesterday at 11 am during the mass that the 32 Vietnamese bishops were celebrating in the Basilica of Saint Paul outside the walls, over which he was presiding. Despite the efforts of the doctors and nurses, he died later at San Camillo hospital. His body is still at the hospital and the Vietnamese community still does not know what to do. The prelates of the Episcopal Conference of Vietnam are in Italy since March 2, after having made a brief visit to the Society for the foreign missions of Paris (the MEPs). During the period of the visit, the bishops had planned several meetings with the Vatican dicasteries. Msgr. Paul Bùi Văn Đọc was president of the Episcopal Conference during the period 2013-2016. He was born on 11 November 1944 in Da Lat, in the mountainous province of the central highlands. In 1956 he began his studies in the seminary in Saigon. Between 1960 and 1970 he then continued his studies in philosophy and theology at the Urbanianum University in Rome and was ordained a priest on December 17, 1970 in Da Lat. In 1975 he was appointed rector of the major seminary of Minh Hòa, in the diocese, where he remained until his appointment as vicar general in 1995. For this long period he also worked as a professor of theology in the seminaries of Saigon, Hà Nội and Huế (1986-2008). Pope John Paul II appointed him bishop of My Tho on March 26, 1999. His episcopal consecration took place on March 20 of the following year, through the hands of Archbishop Jean-Baptiste Phạm Minh Mẫn of Ho Chi Minh City. On September 28, 2013, Pope Francis appointed him coadjutor archbishop of Ho Chi Minh City and on 22 March 2014, he succeeded Card. Phạm Minh Mẫn, as the third pastor of the archdiocese, which was erected in 1960.